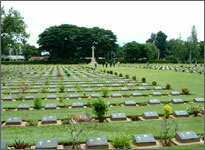 Arrive at Kanchanaburi, visit to War Museum (Thailand-Burma Railway Centre) and War Cemetery. Exciting the scenic boat ride lead you to enjoy the differences of three rivers from Maeklong river to Kwai Noi and Kwai Yai river then view to the world famous bridge over the River Kwai. Take a ride through history on the Death Railway Train, passing lush forest scenery. 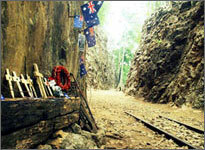 13:00 Take a ride through history on the Death Railway Train, passing lush forest scenery. 14:20 Continue by air-con. Transportation to Bangkok. Pick up from major hotel in Bangkok Downtown area. Depart for Kanchanaburi. Visit to War Museum (Thailand-Burma Railway Centre), War Cemetery and Bridge over the River Kwai. Boat trip 40 minutes along the historic and scenic route of the River Kwai to get to the River Kwai Jungle Rafts or the River Kwai Resotel, passing by unspoiled mountainous jungle scenery. Check-in on arrival. Lunch will be served. Take an exciting boat ride downstream to Resotel Pier and continue to visit to the Hell Fire Pass Memorial. Take a historic ride on Death Railway Train, passing lush forest. Note : Small deviations in the tour program are some times necessary, depending on road condition and availability of rooms. Hearty American Breakfast. After breakfast, relax in paradise at your leisure. 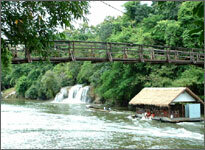 Take an exciting boat ride upstream to visit Saiyoke Yai Waterfall & National Park, experience the nature at its best. 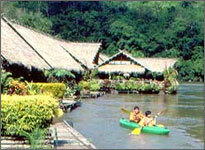 Then, return for Thai Lunch at the River Kwai Jungle Rafts or the River Kwai Resotel. Hightlight : War Museum (Thailand-Burma Railway Centre), War Cemetery, River Kwai Bridge, Hell Fire Pass Memorial, Mon Tribal Village, Elephant Riding & Bamboo Rafting and Death Railway Train. Lunch, followed by visiting to Mon Tribal Village and Elephant Riding through bamboo forest. 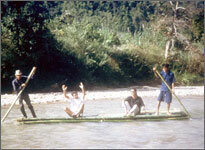 Check-out and transfer to the River Kwai Resotel by bamboo rafting. Hightlight : War Museum (Thailand-Burma Railway Centre), War Cemetery, River Kwai Bridge, Mon Tribal Village, Canoeing, Naturel Healing Thai Style & Aromatherapy and Death Railway Train..
After breakfast relax with Thai style solar bath and take a walking tour to visit to a herbal and a horticultural garden and pick up fresh herbal plants for the Thai cooking course and the Herbal steam bath. Lunch at the resort, followed by Royal Thai Traditional Massage & Herbal Pad & Herbal Steam Bath. 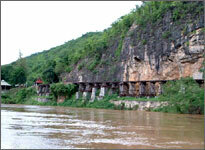 Hightlight : War Museum(Thailand-Burmar Railway Centre),War Cemetery, River Kwai Bridge, Mon Dance, Mon Tribal Village, and Death Railway Train. 06.00 - 06.30 Pick up from Bangkok downtown hotels and depart for Kanchanaburi. 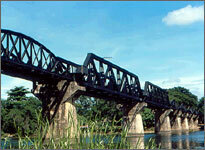 09.00 Visit to War Museum (Thailand- Burmar Railway Centre), War Cemetery and Bridge over the River Kwai. 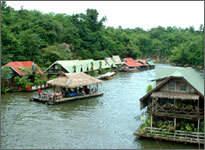 12.00 Take a long-tailed boat from pier to get the River Kwai Jungle Raft or the River Kwai Resotel, passing by unspoiled mountainous jungle scenery. Afternoon relax in paradise at your leisure. 19.00 Candle light dinner and overnight (at River Kwai Jungle Raft or the River Kwai Resotel). and overnight (at the River Kwai Jungle Raft or the River Kwai Resotel). 14.20 Continue by air-con. Transportation to Bangkok. - Welcome drink / Fruit & flower in the room. - Candle Light Dinner Private Arrangement. - Excursions & Entrance fees as mentioned in the program. - Accommodation & Meals as mentioned in the program. Note : Small deviations in schedule are some times necessary, depending on road conditions. 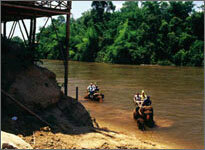 This site is provided by E-Biz Travel, your great selection about Travel Thailand. Lots of information on Thailand and hotels in Thailand from budget to luxury hotels serving your leisure or business trip. Enjoying extremely discounted rates for Thailand hotels online reservations with USD.